ATLANTA – Upstage Video put together one of the largest portable Daktronics LED video displays ever built to meet a simple but challenging spec by corporate jet manufacturer Bombardier – to make the outdoor display big enough for a full-sized image of the company's new Global 7000 and Global 8000 series jets. 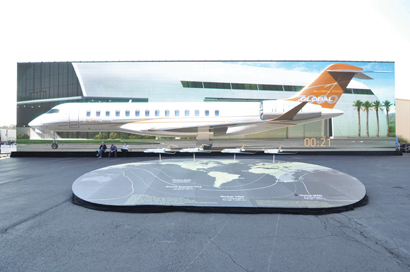 "Bombardier approached us requesting that we create a screen the same size as their new aircraft being launched," noted Aileron Group president Matthew Coull. "They wanted to show the immense size of this new corporate jet." The result was a display measuring 27 feet high and 115 feet wide, comprised of 261 modular Daktronics PST-12HD panels. Aileron Group turned to Daktronics rental partner Upstage Video to assemble the display. They worked with CCR Solutions and T&B Equipment Company, which provided the ground support scaffold structure. The big screen was used to display a four-minute reveal video clip, first shown to the aviation press the evening before the National Business Aviation Association's (NBAA) 63rd annual convention. The video also played during the convention itself, according to Upstage Video president Doug Murray. "There was no way this could have been done with projection," Murray emphasized. "Most of the presentation was in late afternoon with direct sunlight, and the normal show hours were all with direct sunlight." For the production crew, the sheer size of this project entailed some technical and logistical hurdles, including finding a way to secure the massive screen within feet of many very expensive corporate jets. "We overcame these hurdles and the final result was simply stunning," said Coull. "The screen was the talk of the show." "Aileron and Bombardier have been great clients for years, and they are always pushing us to the limit of our capabilities," Murray noted. "Our team did their homework and the event went off without a hitch. It was a truly awesome screen, with some delicious content. As usual, the Daktronics PST-12HD panels made mincemeat of the sun. It's our first choice when building spectaculars such as the one for Bombardier." Daktronics PST-12HD panels feature 7,000 nits of intensity, a new pixel layout for enhanced contrast, optimized viewing angles and 19-bit image processing for improved image quality. The modular design of the PST product line also gives users the ability to construct displays of nearly any size or shape. "We expect some of our sporting event clients to step up and challenge the title of the "largest ever," Murray said. Despite the challenges, he added, "the bar has been set, and we're confident we could have made it bigger with ease." The NBAA convention, which drew about 25,000 government officials, manufacturers, aviation personnel and industry leaders with an interest in business aviation, ran from Oct. 19-21, 2010. For more information, please visit www.daktronics.com and www.upstagevideo.com.